With winter nearly here, many of us are spending the last bit of time we can outdoors. For us, this means more hiking and spending time outdoors. Since autumn for the Cincinnati area usually means cold temperatures too, this means are cars are constantly covered with salt and whatever is put on the roads in case the thermometer dips to freezing levels. While this is good for us, it usually isn’t good for our muddy cars. After a good wash though, you obviously have to wax, right? The problem for us was that we were waxing our cars by hand. 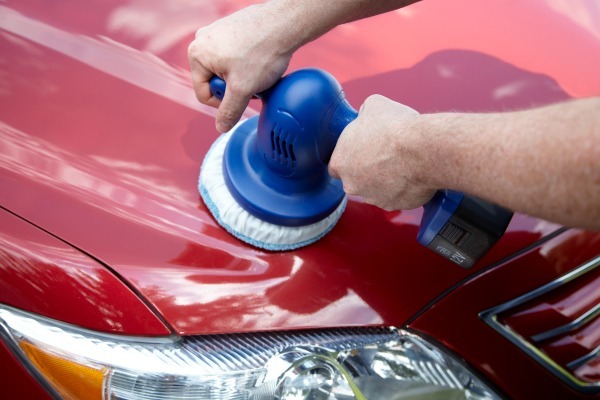 As you know, waxing a car by hand isn’t easy or fast, leading to us eventually looking for a buffer or polisher. Luckily, we found the perfect thing, the AutoRight 6 Inch Cordless All Purpose Polisher! AutoRight 6 Inch Cordless All Purpose Polisher: What Is It? Looking for the perfect polisher or buffer for applying wax to your car? If so, we think you will love the AutoRight 6 Inch Cordless All Purpose Polisher. This powerful little cordless tool is perfect for polishing metal, plastic, paint, or even glass. Of course, its best use is for applying and removing wax without having to worry about electrical cords or finding an outlet outdoors. With the 12 Volt NiCad Rechargeable Battery with this unit, you can expect to use the polisher for about 40 minutes of run time. Once you have tried this polisher, you won’t wax with anything else! Having used the 4 Inch buffer for our Headlight Restoration Kit, I have to say I started with very high expectations for this buffer. To our delight, we were not disappointed at all. This buffer did a great job polishing and making our cars looking amazing. I found that it was even good at doing little touch up spots on the car missed during washing. Really, if you are looking for a buffer for waxing your car, this seems like the perfect size for the job, especially if you want something that is easy to manage. Based on our own experience, we are happy to give the AutoRight 6 Inch Cordless All Purpose Polisher an A rating. 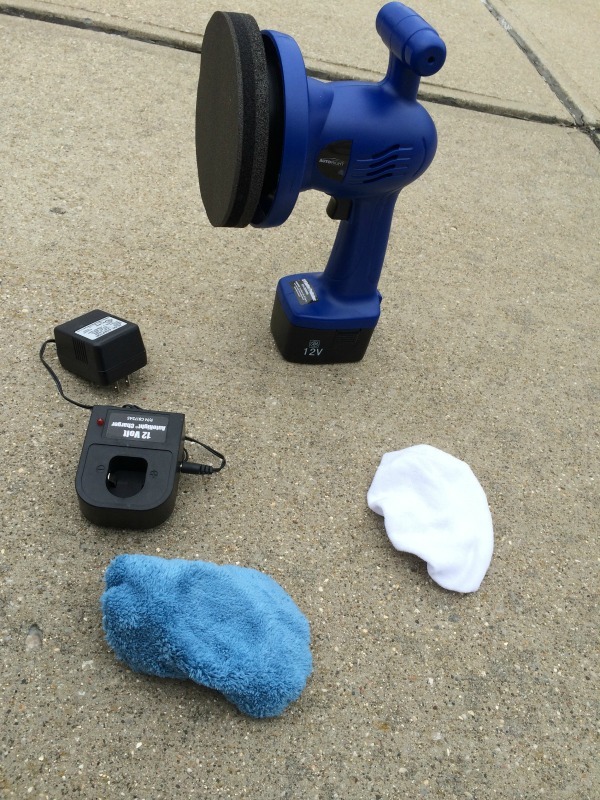 Would you like to purchase this awesome polisher for yourself? You can buy the AutoRight 6 Inch Cordless All Purpose Polisher on AutoRight’s website for only $69.99. To see other retailers that sell this polisher, make sure to head over to the AutoRight store locator here! The AutoRight 6 Inch Cordless All Purpose Polisher would be a gift for my husband. He is the one that cares for our car. He uses Turtle wax & a cloth & hand power to wax our car at least once a year. The AutoRight 6 Inch Cordless All Purpose Polisher would be used by myself. I like to keep my car shining to catch everyone’s eye when driving it. I will probably lose this sweeps but for me to use I did not see the weight of the item. The price is perfect but weight? Other then the wieght, great review. This would be perfect for my husbands truck, he works in consrtruction and his truck gets very dirty. This polisher is something I would actually try.I can’t hand wax my car anymore my arm gives out before I even get half way through.I love that it’s cordless and the price is amazingly low too! I like that this polisher is cordless. I wish it lasted longer than 40 minutes but again cordless is great! I have never waxed my car, seemed like a lot of work. This looks like it makes the whole waxing task easier. I have only waxed my car a couple of times. It really takes some elbow grease. My arms were sore the next day. This would make the job much easier. Would love to win this AutoRight 6 Inch Cordless All Purpose Polisher. I am the one who cares for my car. I wish I had one of these, I bet they work wonderful. They would be a great present. My husband would love the AutoRight 6 Inch Cordless All Purpose Polisher. Thanks for the review, it’s makes shopping for the right gift easier. My husband would like that it has a 12 Volt NiCad Rechargeable Battery and not a long power cord. I love the concept of this and its ability to make things easier. I’m all for that!! My Grandson would love this one. He’s a real car nut and is always working on one. Thanks for review! I’ve never seen a cordless one before. That is really convenient. I also like that it’s a multi-tasker, polishing metal, glass and plastic along with applying wax! Love this item. It is hard work to polish a car by hand. I think this is marvelous. Thanks for the information on this item. This is an awesome item. I would not only use it on the car, but I think it would be handy for buffing wax on furniture after I finish restoring it. This would be awesome for my husband. He loves his car but since having a family has had less time to modify and take care of his first baby! My daughters are very into cars and this would be great to have for them. Daughter #1 has an ’86 Toyota Corolla hatchback sitting in our garage that is being restored (probably the best car ever made for “drifting”). Daughter #2 has an ’98 Eclipse that’s in amazing condition, but with the age, it needs to get a good detailing every so often – and it could use one now. This would be perfect for them! The best part is that it’s cordless, my son would love to get this under the Christmas tree this year. My brother in law would LOVE this!! He is a HUGE car buff so a gift like this would be perfect for him. My car really needs some TLC, so this would be great. I try to wash it once a month but don’t always get to it, and I drive a lot as the family taxi so my car gets dirty really fast. This would make cleanup so much easier! This would be an awesome gift to give my soon to be 16 year old. Maybe with this he would keep his car cleaner. The AutoRight 6 Inch Cordless All Purpose Polisher would be perfect fir a gift for my husband. This would be awesome helping to make our vehicles sparkle! This looks really awesome. I like that it’s plastic and has rounded edges so I don’t have to worry about scratching up my new car. Last week my 22 year old son not only set a heavy box on top of my hood but slid it all the way across, so now I need something to buff out the hundreds of tiny scratches. I think this would make the perfect Christmas gift. It looks simple to use as well. I would love to have it! 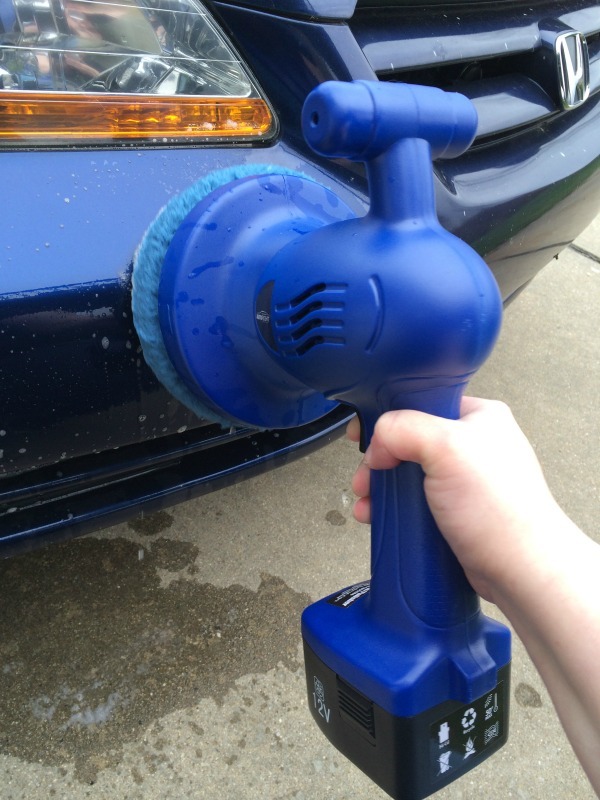 The AutoRight 6 Inch Cordless All Purpose Polisher would be a gift for my husband.He loves taking care of our vehicles. This would be the perfect gift for him.